Intermittent fasting is gaining popularity,to reduce body fat while protecting muscle mass. Short periods of calorie reduction though intermittent fasting can extend life, protect against disease through detoxification and increased immune activity, and rest the digestive system. The challenges of intermittent fasting come from feeling hunger. The body needs about 30 hours to enter into the state of catabolism where hunger ceases. During intermittent fasting most people feel hungry and weak after a few hours of missing a meal, and eating a low calorie mean mean the hunger will return quicker therefor intermittent fasting requires more discipline than a longer fast. Intermittent fasting is to have periods where you do not eat or drink fresh juices. 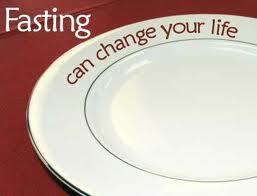 Fasting for one day a week can have huge benefits such as increased alertness, energy, weight loss. Drinking fresh juices for the day and eating light meals of fruits or veggies following the fasting day can be a life booster. Intermittent fasting can include 2 days fasting/ 3 days eating, 1 day fasting/ 2 days eating, 5 days fasting/ 2 days eating. Intermittent fasting can be flexible to your life needs such as fasting on the week ends and eating during the week when you need more energy. Reduced blood lipids, decreased body fat, reduced blood pressure, reduced chronic inflammation, reduced oxidative stress, reduced risk of cancer, increase fat burning, increase growth hormone, improve appetite control, increase insulin and sensitivity and decrease insulin level, improved cardiovascular function, and improve memory and cognitive function.